For more than two decades, the Ford School has hosted an annual student-led fundraising effort that spans both semesters and raises money for a nonprofit nominated and selected by students. The initiative is headed by members of the Charity Auction Committee, who plan small events throughout the year that culminate in a school-wide formal including both silent and live auctions. 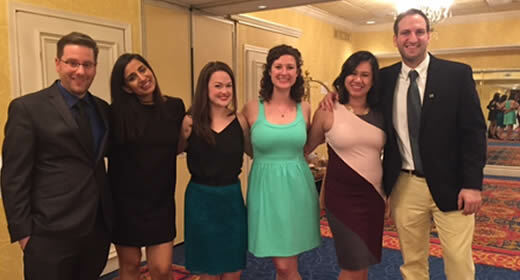 The Charity Auction and other fundraising events are more than just fun, slightly quirky, opportunities for the Ford School to come together for a great cause. In the past decade alone, these events have raised over $121,000 for non-profit organizations local and international. The tradition continues in the 2016-17 school year, with proceeds going toward the Flint Child Health and Development Fund of the Foundation for Flint. This year’s Charity Auction will benefit the Flint Child Health and Development Fund, otherwise known as the Flint Kids Fund. The fund awards grants to support the long-term needs of Flint children exposed to lead. This includes nutrition education, integrated social services, health services, and early childhood education. The Charity Auction fundraising events this fall included a trivia night at the Blue Leprechaun on October 20 and a No-Shave November. For the month of November, students and professors gathered pledges to grow certain styles of facial hair (or to go clean shaven for those who normally sport beards). The month raised a total of $1,250 in pledged support. Upcoming events this semester include a bowling night at Revel & Roll on January 31, a series of Top Chef Bake-Offs in March, and the culmination of the fundraising year at the Charity Auction itself on April 1, 2017. What will this year’s silent and live auctions hold? The Charity Auction Committee will start accepting in-kind donations starting in the winter semester. They are hoping to have at least 60 items donated by local businesses and Ford School community members. Submissions run the gamut from excursions with faculty members to donated items from local businesses. Last year, the most popular item sold was the “Youngish Faculty Cocktail Party,” hosted by Megan Tompkins-Stange, Kevin Stange, and other “youngish” faculty. The party went to a group of students for $2,350. Another crowd favorite was Alli Zimmerman’s donation of “time with Hugo,” her puppy. This year’s Charity Auction committee members are: John Guerriero (MPP ’17), Kate Naranjo (MPP ’17), Ivy Tran (MPP ’17), Jonathan Beam (MPP ’18), Diego Campos (MPP ’18), and Lydia Miller (MPP ’18).